Current market conditions provide indications of the safety net that crop insurance will offer for 2019. At this point, the 2019 projected price for corn is forecast to be about the same level as in 2017 and 2018: $3.96 per bushel. Given an increase in APH yield, corn guarantees in 2019 could increase over 2018 guarantees for the same coverage level. The soybean projected price is forecast to be $9.22 per bushel, about $1 per bushel lower than 2017 and 2018 levels. As a result, soybean revenue guarantees in 2019 will be lower than in 2018, given that the same coverage level is selected. Per acre premiums for crop insurance in 2019 likely will be much higher than 2018 premiums due to higher volatilities. At high coverage levels, corn premium could increase over $5 per acre and soybean premiums by $3 per acre. These are estimates and much could change between now and the price and volatility setting period in February. where the APH (Actual Production History) yield is specific to the insured unit and coverage level is selected by the farmer in a range from 50% to 85% in 5% increments. Many farms will have higher APH yields in 2019 because of exceptionally good yields in 2018, thus resulting in higher guarantees. Change in projected prices also will impact per acre guarantees. 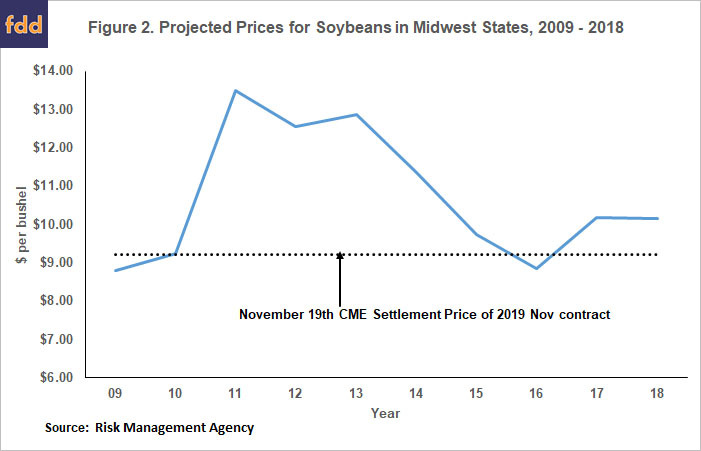 The projected prices for corn and soybeans in Midwest states are averages of settlement prices of Chicago Mercantile Exchange (CME) contracts during the month of February. The next December contract is used for corn. 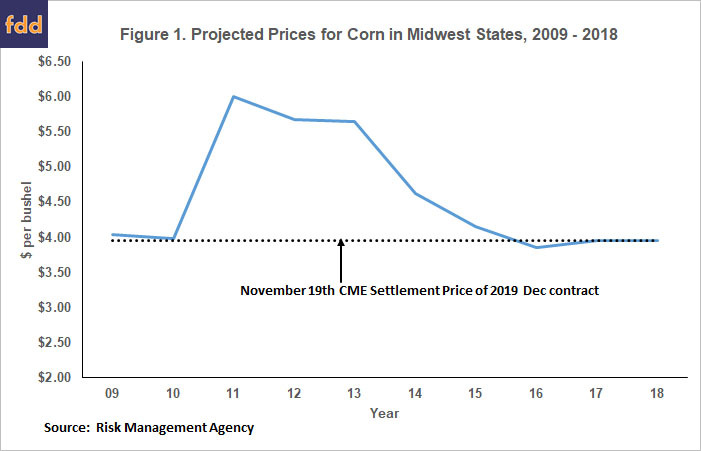 The 2019 projected price will be based on settlement prices of the December 2019 CME corn contract during the month of February 2019. The November contract is used for soybeans. Research generally shows that CME futures contracts are unbiased indicators of prices in the future. Therefore, the current level of the December 2019 future contract is a good indicator of the 2019 projected price. Similarly, the current price of the November 2019 soybean contract is a good indicator of the 2019 projected price. Projected prices for corn were $3.86 per bushel in 2016, $3.96 in 2017, and $3.96 in 2018 (see Figure 1). The settlement price of the December 2019 contract on Monday, November 19 was $3.96, coincidently the same as the projected prices in 2017 and 2018. Therefore, current futures prices suggest that the 2019 projected price for corn will be at the same level as that of recent years. Because most farmers will have higher APH yields, minimum revenue guarantees in 2019 likely will be slightly higher in 2019 as compared to 2018, given that the same coverage level is selected. Projected prices for soybeans were $10.19 in 2017 and $10.16 in 2018. The settlement price of the November 2019 contract on November 19 was $9.22 per bushel, almost $1 per bushel below projected prices in the two most recent years. A $9.22 projected price in 2019 would be the third lowest price in the last ten years, with only the 2009 price of $8.90 and 2016 price of $8.85 being lower (see Figure 2). Volatilities indicate the market’s perceptions of the possibilities of price movements in the future. A higher volatility suggest that prices will vary more in the future. Volatilities also impact crop insurance premiums, with increases in volatility resulting in higher premiums. Between 2011 and 2018, volatilities used for corn crop insurance policies have been on a declining trend from .29 in 2011 to .14 in 2018 (see Figure 3). For corn, the 2018 level of .14 was the lowest since 2011. Soybean volatilities declined from .23 in 2011 to .13 in 2014. From the .13 level in 2014, soybean volatility varied from year to year but did not trend up or down. The 2018 volatility for soybeans was .14. Similarly, a .19 volatility for soybeans will result in a much higher premium. In 2018, a typical 85% RP premium in Logan County was $8.56 per acre. A .19 volatility would result in an $11.65 per acre premium, an increase of 36%. The above premiums were calculated using 2018 rates. Rates for 2019 have not been released by the Risk Management Agency. These rates will change premiums and the direction of those impacts is not easy to predict. Moreover, volatilities could be different in the last five days of February, the period that RMA uses to set volatility. Still, it seems reasonable to expect higher premium in 2019 due to higher volatilities. As designed, projected prices react to current market conditions, resulting in crop insurance providing very good inter-year protection, but less protection across years. In 2019, current market conditions suggest a significantly lower projected price for soybeans. 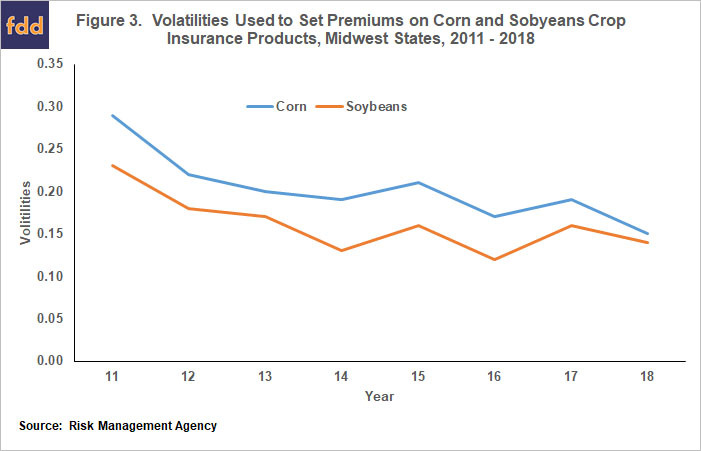 Higher volatilities likely result in higher premiums for both corn and soybeans in 2019. These projections were made using prices in late November. Much can change between late November and February when projected prices and volatilities are set. Still, it seems reasonable to expect lower soybean guarantees and higher corn and soybean premiums. Schnitkey, G. “Overwhelming Use of Harvest Price Option Crop Insurances.” farmdoc daily (8):83, Department of Agricultural and Consumer Economics, University of Illinois at Urbana-Champaign, May 8, 2018.